Our 2013 Christmas Display is over. Thank you for viewing and donating to Friends of the Warwick Animal Shelter. 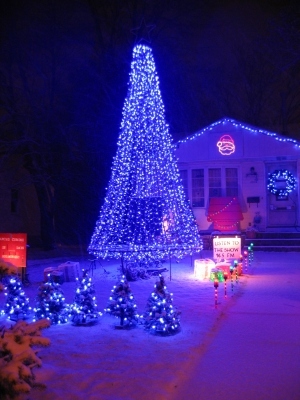 The Rowland Family Christmas Display is located at 3073 West Shore Road in Warwick, Rhode Island, USA. For 2013 we had 35,000 lights sequenced to music. Most of the lights are LED for bright, vivid colors. The lights are connected to 300 individual circuits controlled by a computer. 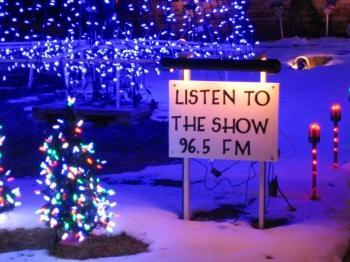 We broadcast on 96.5 FM using a low power stereo transmitter so you can enjoy the show from the warmth your car! We also have speakers in our front yard for listening from the sidewalk. We collect donations for the Friends of the Warwick Animal Shelter. Thank you for your donations! Every dollar is used to help the animals. Friends does a great job helping homeless animals by improving conditions, increasing public awareness, providing foster homes, and assisting with adoptions. For more information please see our Donations page.